Enjoy Shipwreck Diving Coron Island Palawan Philippines is a wedge-shaped limestone island, that has mangrove forests covering some of its coastal areas. It has seven lakes, including the nationally-acclaimed cleanest and clearest lake in the Philippines the Kayangan Lake. It also has a number of islands with white beaches and clear blue waters perfect for snorkeling, deep sea fishing and shipwreck diving. 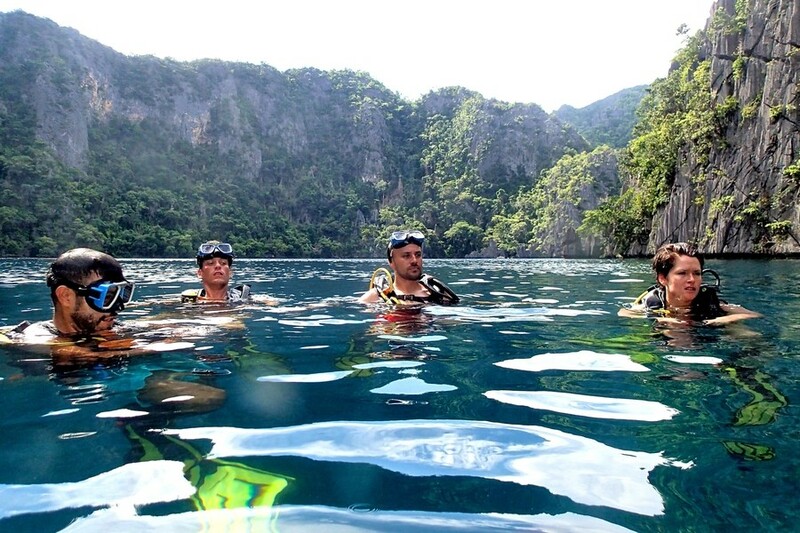 Come dive at Coron, Palawan with Fun & Sun! On the morning of September 24th 1944, a group of US planes composed of 96 Grumman Hellcats and 24 Curtis Helldivers took off at sunrise. By 9am, they reached Busuanga Island and found 12 Japanese ships anchored in the Bay of Coron and other bays nearby. The Japanese ships were looking for an ideal location for shelter. Historical records show that it took barely 15 minutes to severely cripple a fleet of transports, cargo ships, freighters, oilers and seaplane tenders, all of which sank in relatively shallow waters hours later. Today, this tragic event of the Second World War provides an amazing area for divers to discover the remains of this battle. The wrecks lay between 5 meters and 45 meters from the surface and are accessible to recreational divers. While Advance Open Water certification would be needed to be able to enjoy all the wreck sites, Open Water Divers have the opportunity to visit several of these nice ships, which are within Open Water limits. Penetration is possible in several wrecks, but just passing over the decks, by the guard rails of the ships, provides an already awesome experience. The marine life is rich around these wrecks and has attracted a great biodiversity from the smallest nudibranch to schools of Jacks. Apart from the wrecks, Coron and Busuanga Island offer other beautiful sites such as the famous Barracuda Lake, which has one of the most stunning scenery. Barracuda Lake’s lagoon, Cathedral dive site and famous Apo Reef, is included in some of Fun & Sun’s exciting dive expeditions. If you have a few days and want to experience the feeling of an exploration expedition, join us for our Apo trips, and you will most likely catch a siting of the once thought of mermaids; the friendly Dugong otherwise known as the “sea cow” (Apo trips are usually run between November and May). Fun & Sun has recently opened its latest dive center in Coron Town in March 2014 to help showcase the beauty and wonder of Palawan province and its marine life, of course. With a professional & dedicated team (our local guides have over 17 years of experience diving around Busuanga), brand new equipment and gear, amazing banca boats and Nitrox capabilities, we can show you all this beautiful island has to offer. There are over 30 recorded dive sites around Coron and below are our top ten dive sites nearby. We are discovering new dive sites regularly and not just wrecks. So, do ask our team about their latest find. 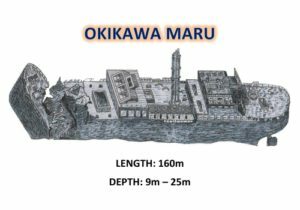 The Okikawa Maru is a Japanese oil tanker. With a maximum depth of 26 meters and the main deck at 18 meters, the bottom time is expected to be good, especially if using Nitrox. There are lots of corals growing all over the ship and good amounts of critters such as nudibranch. Strong current is usually common but ideal for attracting large schools of fish. You can penetrate the wreck with a swim through the propeller shaft. The Akitsushima is a Japanese Seaplane Tender. Her crane is down in the sandy area and you can see her anti-aircraft guns lying there as well. 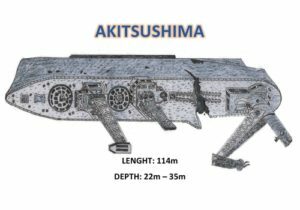 The Akitsushima was hit by a bomb and the split is a good start for penetration. Many of the passages inside are small so it is recommended to have a high skill level to be comfortable while exploring that wreck. 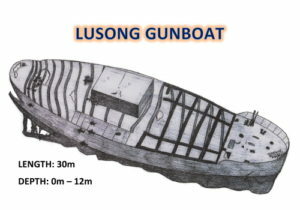 The Lusong Gunboat is visible at the surface during low tide so it is a perfect wreck for Open Water divers. Marine life around the ships is very rich and even snorkelers can enjoy the wreck. 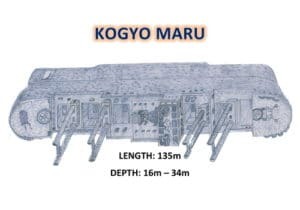 The Kogyo Maru was a Construction Supply Ship. She now lies on her starboard side at 36 meters. Supply of concrete can be seen as well as an old cement mixer, bulldozer, and rolls of chain link fences. As per historical data, the material was intended to build an airstrip. 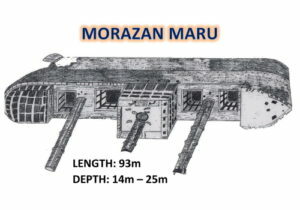 The Morazan was an English passenger cargo vessel that was captured by the Japanese Navy. She sits on her starboard side. The Morazan’s four massive cargo holds are empty, but a pair of massive boilers in the engine room is what is interesting to see. While this wreck is ideal for Open Water, the Advance divers will enjoy a complete penetration from bow to stern. 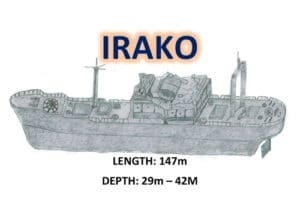 The Irako was a refrigeration supply ship. She sits nearly upright. 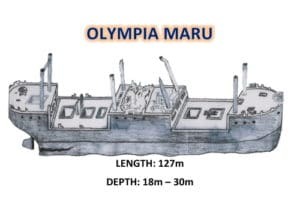 Aside from the bridge, which took a direct hit, the Irako is in “good condition: There are many ways to penetrate the wreck, but small passages and dark areas make it for experienced divers. Jacks, Snapper, Lionfish can be found all around the wreck. The Olympia is a cargo ship. Sitting upright, her large cargo holds offer good penetrations without any difficulties. The locker room at the bow can be used as a passage as well. The sides of the Olympia are covered with black corals and apart from the colony of Lionfish, you may find some rarer creatures such as seahorses and ghost pipefish. CYC Island is one of the areas where we conduct skills session for the Open Water Course due to the sandy bottom and adequate depth. There is an interesting reef which will allow some exploration after the skills are done. 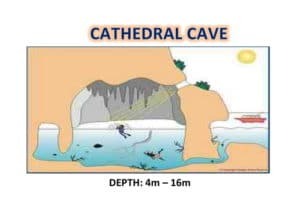 The Cathedral Cave is located about 1hr 30 minutes from Coron Town. It is not really a cave, but more of an underground lake. After a short swim through, you will find yourself in a “cave” with breathable air at a fracture in the upper side. During certain times of the day, the lighting is surreal, which is the reason why Cathedral Cave was given its name. In rough seas, diving at this side isn’t possible as the boat can’t approach the starting point of the dive. 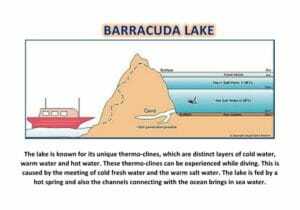 Barracuda Lake is a very special dive site. The mix of fresh water and salt water create wondrous thermoclines which, sometimes, can take you by surprise. Water temperature rises to 40 degrees so you really don’t need a wetsuit for that dive. The underwater scenery is simply amazing and will make you feel like you are walking on the surface of the moon. You will not find much marine life (although there are some Barracuda in the area).